Phil Spector is acknowledged by journalists and peers as one of the most influential figures in pop music history. His work includes collaborations with Tina Turner, Leonard Cohen, The Ronettes, The Crystals, Righteous Brothers, The Ramones, The Beatles as well as with John Lennon and George Harrison’s solo careers. Phil is most known for his recording technique dubbed the “wall of sound”, where he would record several instruments playing the same part. He would do this using legendary session band the Wrecking Crew, a group of L.A based session musicians that played on countless hits in the 60s and 70s. Phil’s most recognized hits include ‘River Deep, Mountain High’, ‘Da Do Ron Ron’, ‘Unchained Melody’, ‘Then He Kissed Me’, ‘Be My Baby’, ‘You’ve Lost That Loving Feeling’, ‘The Long And Winding Road’, ‘My Sweet Lord’, ‘Let It Be’, ’Imagine’ and ‘Happy Xmas (War Is Over)’. Phil Spector’s career begun to slow down in the mid-70s following a near-fatal car accident which would see him having 700 stitches to his face and head. For the second half of the 70s, he did some work with Leonard Cohen and The Ramones until the 80s came around and Spector became reclusive and inactive. In, 2003 actress Lana Clarkson died in Spector’s famed mansion. The emergency call quotes Spector as saying, “I think I’ve killed someone”. He was convicted in 2009 and sentenced to 19 years in jail. Countless artists have stated Phil Spector’s production techniques as a major influence, including Brian Wilson (Beach Boys), Bruce Springsteen, Brian Eno, My Bloody Valentine, Johnny Franz (Dusty Springfield), ABBA and Meatloaf. As one of the most important producers of the last century, Phil Spector can be found on many top 10 lists, rubbing shoulders with other greats such as Rick Rubin, George Martin, Mutt Lang, and Quincy Jones. 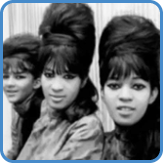 ‘Be My Baby’ is an early ‘wall of sound production’ by Phil Spector and The Ronettes. When playing this with a band, we need to create a big sounding guitar part to compensate for the lack of an orchestra. 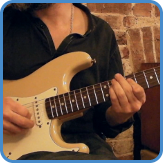 In the course, we practice each section over live band loops as we explore the guitar neck and create our own, unique guitar part. Finally, you get to play the entire song with a live band! For complete lyrics, go to Be My Baby lyrics.